At 7:09 pm, Joanne died peacefully surrounded by loved ones. Her journey has been long and difficult and at last she can rest. I will post again with more details once they are finalized. On behalf of the family, thank you for all of the support that you have given Joanne over the past few years. My heart goes out to all of you. What a journey. Yes we all loved her. Thank you again for your courage and strength. JoAnn was wise and gracious to the end. I wish I had known her longer, and as more that a cyberfriend, breast cancer sister. She always had the right words. We are thankful her suffering is over. I'm so very sorry for this loss and my heart goes out to the Schweitzers and Condons. I will always be grateful that I knew Joanne. Life is sweet. Love is sweet. Joanne was surrounded by love, as are you all. Our deepest sympathy to you all. We have lost an incredible friend and sister. Words cannot express the depth of my sadness and the sympathy I hold in my heart for the Schweitzer, Condon, and Sherlock families. Wish I could be there to hold you up. Love to all. There are no words that I can say that can possibly express how grateful I am to have had Joanne in my life. My heart goes out to all of her family. My deepest sympathy to all of Joanne's family and friends. She has touched the hearts of many and will be deeply missed. Thank you, Darryl, for keeping us near through her blog. My thoughts and prayers go out to you and all the family. Joanne touched my life through bcsupport.org and will always remain in my heart. cry on my shoulder, I'm a friend. But I am sure she now has found the peace and sweetness she wanted. My heart goes out to all her family and friends, may you all find the strength to go on with life. Joanne will never be forgotten. Missin' Joanne already. I know her journey was hard and the end is a mixed blessing. My thoughts go out to her family, the Schweitzers, Condons and Sherlocks for their courage and support of her and to Darryl, for taking the time to keep her friends informed. I deeply appreciate the effort it took to do that. I wish all y'all peace and many, many fond memories of Joanne over time. I hope your grief is eased by knowing she was able to stay close to those she loved the most and that was so important to her. You gave her the most valuable gift a mother, daughter, sister and wife could desire.....more time with her family. I'm absolutely sure the cost was terribly high. My thoughts go out to you at this sad time. All my best wishes to Gord and the kids. Godspeed Joanne. My heartfelt sympathies to her family and friends. My heart has always gone out to Joanne for the journey she had to face. And now it goes out to you and all the family, for yours. Joanne knew she was loved. I don't think she could ever know just how much. I will miss her terribly. Much love to your mom and dad, your siblings and to Gord and the kids. My love and sympathy to all of you. I know that this has been such a long journey with so much sadness and heartache. Joanne was an amazing friend, daughter, mother and wife who has taught us so many lessons and I know that her wisdom will continue to surround us. I am so sad that I will not be at the celebration of her life, but I will be with you all in spirit. Thank you, Darryl, for writing with this very sad news. Joanne will be lovingly remembered for her wisdom and grace and for the gentle way she had of understanding another's heart. May our prayers for all of Joanne's family - the Schweitzers, the Condons, the Sherlocks - help bring some comfort and peace to each one during this most difficult of times. "Good night, sweet princess, and may flights of angels lead thee to thy rest." 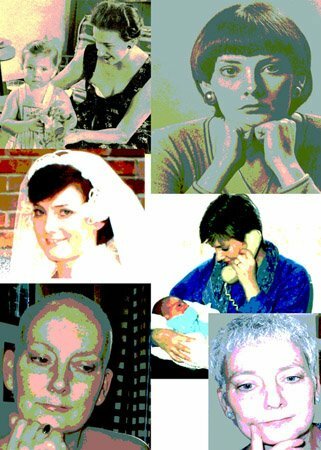 I "knew" Joanne on the breastcancer.org website. She was a truly remarkable woman and I am so sad that she is gone. My love and prayers to her family. I'm so sorry. My deepest sympathy to the family. Joanne was a wonderful person. Our sincerest sympathy goes out to all of Joanne's family. It was a privilege to know Joanne and our lives will never be the same for having known her. May you all feel comforted by your memories and may the love of family and friends give you courage and strength. As always our thoughts and prayers go out to you. God Bless!